Show your designed ideas about using colors in decorating? Or share interior design styles with your friends? Here is a fabulous way to help you to present still text and images, use Flip programs to build page flip books, with the fresh published Float House Themes. The free theme package designs color and background mated templates based on house decorating style, you will find warm welcome style living room, nice flowers decorated windowsill, green plants, neat and clean chairs, etc. 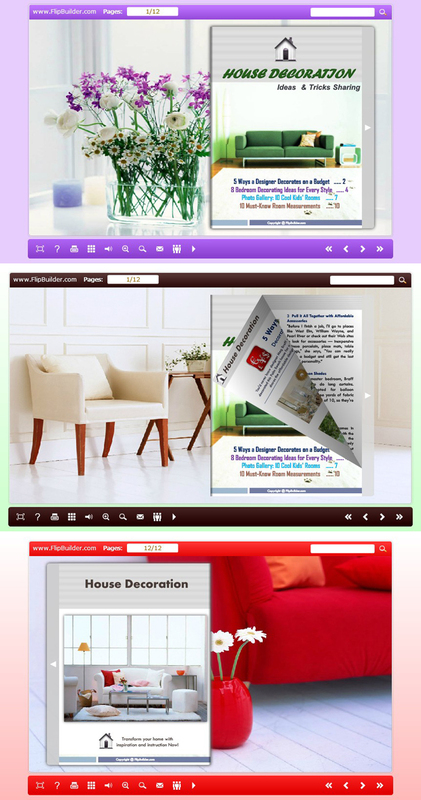 Use the themes to beauty your interior design magazines, with popular page-flipping flash effect. 1. Run Flip program; 2. Click Menu: File->Import Theme, select the *.thm (themes) form open dialog box; 3. Open Template Window by clicking "Classical/Float/Spread" to choose imported theme in Select Template interface; 4. Use the theme you have just imported. Note: All free Flip Themes Packages are available in any FlipBuilder software. With those Themes & Template you can make more professional and interactive Page-Flipping eBook as you want. Real 3D flipbook Series builders Provides Theme: Joyful make stunning digital books. The books completely different from the common ones. They are the real flash book with incredible rolling and flipping animated effect. A unique software to help you turn your digital photos into stunning photo albums with True 3D page-turn effect. It is fun, quick, and easy to use ! In the Lively Indoor Theme package, you can get six different house decoration background and color designed templates, like fresh air, will bring a relaxed feeling to your publications. And the Lively Template provides the vivid buttons and icons. FlipBuilder Conciseness Dark Theme package designs dark series templates for you to use in Flip programs, common red, blue, green, yellow with black hue to make a different style. Like the jeans that go with everything, you can use the themes freely. FlippingBook3D Word to PDF converts Microsoft Word to Adobe PDF offers many benefits for the users who want all the system with no installation of Microsoft Office can view the content on Word document. Flipping Book 3D for CHM - It has never been easier to convert CHM to True 3D flash flippingbook with the professional yet easy to use software! This site does not contain serial number, crack, keygen Flip_Themes_Package_Float_House serial number : serial number is the simplest type of crack. A serial number(cdkey,product key,etc) is register the program as you may already know. a crack or keygen may contain harmful software. If you cannot find the exact version you want, just give it a try. for more information read .nfo/.txt/.diz file include in zipped file.